From an academic standpoint, 2017 has been a very good year for Jordan Barrett ’18. 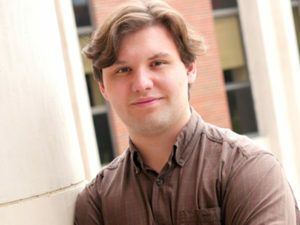 Barrett is a senior physics and mathematics major in the College of Arts and Sciencesand a participant in the Renée Crown University Honors Program. In May, he was one of two Syracuse University Students to be honored with a prestigious Goldwater Scholarship (Maizy Ludden is the other, and a third student, Ismael Gonzalez, received honorable mention). In June, Barrett was named a recipient of the Astronaut Scholarship Foundation award. And just last month, he attended a gala event in Washington, D.C., for Astronaut Scholars nationwide. He recently had a few free moments to answer four questions from Syracuse University News.